served up is not punny is it? Thanks to a rain delay and the longest Men's Championship in Wimbledon history, I got to see the end of the 4th set and the 5th set of the Men's Final today. It was phenomenal. Both Federer and Nadal played amazing tennis. John McEnroe called the best match he had ever seen. No small praise. 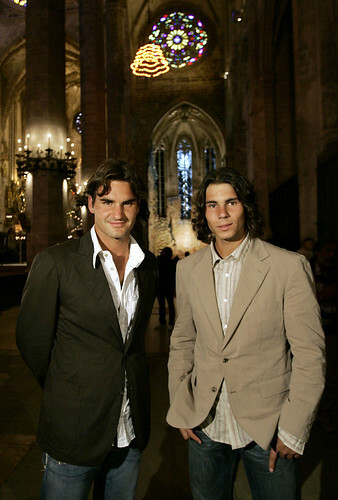 In the end, Nadal won when Federer committed an unforced error during the final championship point. At that point, I didn't care who won. They both served up a great game today. Labels: served up is not punny is it? Good darling I'm glad it's over, perhaps now they can concentrate on grooming, learning how to use an iron, tucking their shirts in and getting a haircut! Snicks is gonna be mad at you. Keep telling yourself that buddy. Does the name Chupacabra mean anything to you? Darling I wouldn't worry too much about Milo a snapping turtle will keep the dear boy in his place.